Welcome to Professional Homes, Inc.
Professional Homes, Inc. is a family-owned, custom-quality home builder, that has been in business since 1972.� As the name implies, professionalism always comes first. At Professional Homes, we'll take the time to design the home that�s perfect for you.� Our offering of homes can be placed on your current foundation or built as a complete turn-key package.� Before deciding on a floor plan, it is important to consider the building lot, lifestyle, future needs, and budget of your family.� We'll take the time to visit your lot and meet your family.� We�ll discuss your present lifestyle as well as what your plans are for the future, so we can suggest the best layout for access, solar exposure and scenery. With over 30 years of experience, Professional Homes has delivered more than 1000 homes throughout West Virginia, Maryland, Virginia (including DC), New Jersey and Delaware.� Offering floor plans ranging from 900 to over 2000 square feet, Professional Homes has a plan for you.� If you can't find a plan that satisfies your needs, look no further.� Customization is also Professional Homes' specialty!� Contact us to learn more about building a custom floor plan designed specifically for you! All of our homes are constructed in state-of-the-art manufacturing facilities, which greatly reduce the impact of weather and provide proven and true construction with quality, brand name building materials.� In addition, each of our homes comes with a 10-year structural warranty for your peace of mind.� Click here to learn more about why modular is the only way to build. 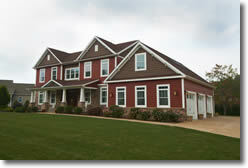 Call us today at 540-545-8600 for help with planning and building your dream home!